your email address if you like, but it is optional. Lovely apartment well suited for six people. Decent sized rooms, towels provided, big clean bathroom and well equipped kitchen and living room. Great location - ten minutes from town. Secure parking available upon request which I would recommend. Adrian really helpful from initial enquiry, additional questions and check in. Recommend for a handy location to the centre of Manchester. We booked with an agent and the whole booking process was easy the company kept us well informed with information via email and we wasn't expecting the text we received the day prior to arrival giving us the address details we had made the booking some months ago. We was met at the apartment by a nice, friendly gent to deal with our check-in we were shown direct to the apartment and had things explained to us verbally and the gent answered all our questions even sorted us out with last minute parking. The apartment pictures don't do the apartment justice and it is a lot bigger than you imagine, our party comprised of a group of friends going out for my birthday and we had time on our hands to get ready we had plenty of seating, there was a docking station DVD player and sky (just the basics) the property had wifi throughout. We had a that good of a night out we got up late the morning after and needed some extra time in the apartment so we phoned them at 9:00 and this lady answer sure she said late checkout until 2:30 at an additional rate ok but between 7 of not an issue cheap enough. I will and already have started recommending these guys to everyone I know even recommended them to my boss who travels to Manchester weekly sometimes he can be bothered coming home he's stayed there already, he's very fussy and he thought they were brill his words not mine, so if your looking for a up market but comfortable places to stay while you have a night in Manchester these guy are great and I would like to say thank you for making my birthday night so good. "Superb Location & Great Apartment"
We booked for a group of friends to have a night out. Much better value than hotel rooms and miles more convenient . We could get together for a drink in the front room, very clean place and lots of space. Stayed here for a weekend for warehouse project. Slept 7 comfy, (2 on couches) Management very friendly and welcoming Everything clean & modern in an ideal location. Good showers and no problems with noise ect. Would definitely recommend. Will 100% stay again. The Apartment was booked in a hurry due to problems with another company and a day after it was booked and sorted I was contacted to say that the my places apartment had been broken into and was now unfit for me and my friends to stay in. However My Places not only offered me a full refund if I should want it and help finding another place but they offered me an upgrade to a full house which could sleep 13 instead of the 6 I originally wanted. This house was amazing and had more than everything we needed. we were given numbers etc to ring for any problems (there were none) and a booklet with suggestions about local taxis etc and had free wifi and sky. All in all my friends and I had a brilliant night out in Manchester and a very comfy nights sleep with the ability to pre drink and eat both in the evening and morning. If you need a place to stay in Manchester, this is it. It is great for one night or for one month. The apartment is a short walk from the station and then everything is on your doorstep. Shopping, business, restaurants, bars, this is a great base for whatever you are in Manchester for. The apartment is clean, spacious and has everything you need. Room Tip: All rooms in apartment were good. I stayed at My-Place a few times now and I alway been treaded fairly and welcome. Each time that I visited Manchester it never come to mind to book anywhere else other than My-places as I find the prices more reasonable than other company and it also give me that feeling as if I am at home as the apartment is modern, fully funish and clean. Location is fantastic because everything is right ouside the door and if i have to travel the bus and train link is very close by or if I had to take a taxi it doesn't cost that much. My-Places staff is one of the most frienflyesy staff I meet, they make sure that I was comfortable and I found the owner is very honest and loyal to his words. I already booked another stay with My-Places in a few months.. 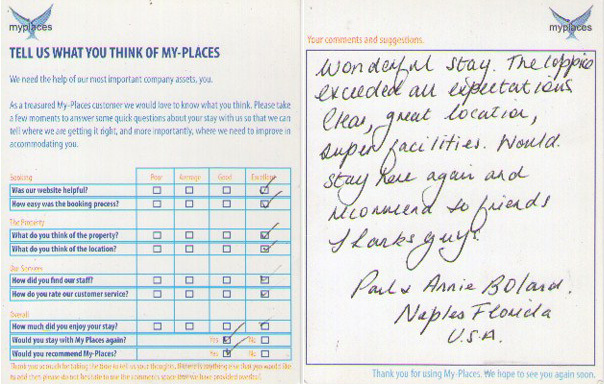 I recommended My-Places my friends who had also stayed with them and they had a great time. Thanks My-Places for a great experience staying with you. See you soon.. The apartment provided a comfortable and more relaxed alternative to a traditional hotel. Very helpful representative met us on arrival. Also liked fact apartment has a secure carpark. Only criticism was lack of mirrors in bedrooms, as an all female group we struggled with drying hair etc. Would definitely use again. I was on my way to Newcastle-UK after a visit to Saudi Arabia and decided to stay few days in Manchester for children fun and shopping. Despite the short notice (I meant it) of 30 minutes-we found everything ready and perfect in My Places. Simply, My places is a very good choice for those of big families or friends and those who are looking forward to staying long time in Manchester and want more privacy. As soon as you walk into the apartment you will receive a wonderful and special welcome from the wonderful Adrian. The rooms are comfortable, clean and spacious. Showers hot and powerful and kitchen fully equipped. With respect to location, it is unbeatable for shopping in city center. Many restaurants , supermarkets different shops and worship places of different cultures just around the corners from the apartment . The staff are polite, attentive, helpful and super. Me and my family feel fortunate to have this stay in My Places, and personally take this opportunity to thank all people work there for making our stay a pleasure and an unforgettable experience. I live in Manchester myself, we had family over from Spain for a week we usually have them stay with us. We were renovating and couldn't host them this time so we looked online for somewhere like home and at a reasonable price. We stumbled across My-Places the price for a week was cheap enough and cheaper than most, the booking process we did over the phone after checking a few of the other bigger sites we researched them and went to them directly we saved on the price doing this as we was able to talk direct to the company. We was met at the apartment by a nice gentleman who was there to check us in, this company offer a personal touch to check-in showing us around the property and we were shown how everything works, after a quick tour and a little signature from my relative the gentleman left us with the apartment. The apartment itself was huge by comparison we had seen photos but they didn't show off its full size and potential, when your away from home space is key, for the price paid a hotel just wouldn't of done we didn't pay that much more than we would for 5 guests in a hotel. I would highly recommend My-Places to anyone and everyone and the family have said not to worry when they come over at Christmas they won't be impeding on us as they know where there staying. A big thank you to all the staff involved and my family say they are looking forward to seeing you again at Christmas. We booked the property for its ideal location as we were having a family get together in the city centre, some of our family didn't want to make the drive back to Leeds so we decided we would book an apartment for them. The booking process was easy and we received plenty of useful information via email and text it felt as though My-Places we always keeping us in the loop and trying there hardest to make sure we knew what was going on. I would highly recommend My-Places to any of my friends and my family really loved the location and the apartment even the free treats left for them went down well with the kids. We only get together once or twice a year as a full family but I know where to come next time for the best service. Thanks for all the effort you have put in. A friend of mine recommended My-Places about 5 years ago and we've been back every year since. N. Arena, Odeon, Piccadilly Train Station, St.Ann's Square, The Arndale, Deansgate etc. The apartment itself is very modern and spacious, kitted out with free wifi and a big screen tv. I like the team there as they've looked out for us on several occasions over the years e.g. airports pickups at unsociable hours, providing extra bedding for additional guests, early and late check-ins/ check-outs, etc. I've seen some slightly cheaper prices recently for apartments close by but the way I see it, My-Places is cheap for extra peace of mind. My wife and children love it. We've stayed at the same place for the last 5 years and are satisfied enough to not look elsewhere. chatworth house is the place to sty especially for family . i have already stayed twice and defiantly planning to book it again if I came back to Manchester. as we came from Qatar with my family and the price was reasonable compared to a nice big and clean flats. in addition , i havent had any problem with the flat during my staying plus neighbours are quite therefore is it suitable for families . the building is very safe which has given me a peace of mind. the agent of the flats are very very friendly and co-operative in many ways. moreover, what makes the flat very nice also that it is 1 min away from piccadily garden in manchester and 5 min walking from arendaile therefore there is no need to use any type of transportation which can save both money nd time . definitely recommend staying at chatworth house and honestly i have no negative reviews as my family members re enjoing their stay. 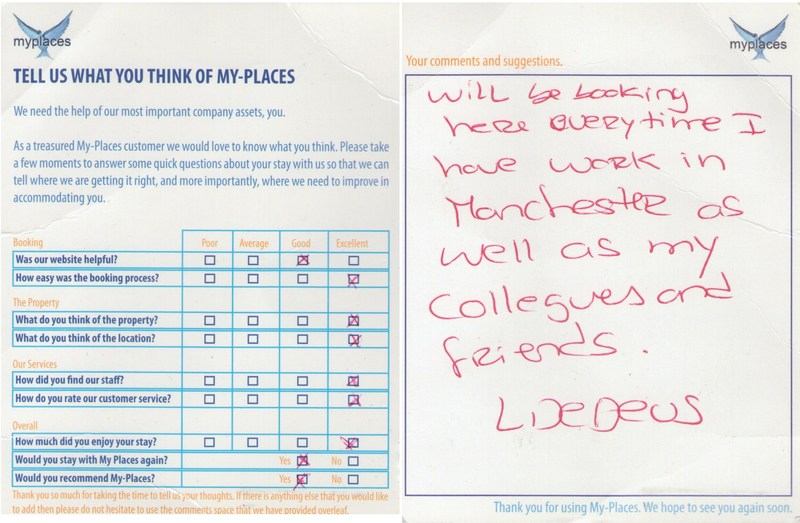 Guest stayed at our Worsley Apartment. Good value, comfortable facilities in good location. The view & privacy of our own home. The home is spacious for a family of six, two young & two older girls. The site manager was great waited three hours for us to appear at airport! She was awesome. I stayed an extra night no fuss about that! i would rent this place again! I was looking forward to my holiday in Jamaica for almost a year, having booked in advance. And my stay in Montego Bay only being for one night, I was really hoping for comfort above all else before travelling on to Negril the following day. I was not disappointed. I was picked up from the airport promptly upon my arrival by a friendly, welcoming host and enjoyed a smooth ride over to the apartment which is located in the peaceful district of Unity Hall. Upon my arrival at the apartment I was stunned by the breathtaking views looking over the bay and out onto the Caribbean Sea. The apartment is situated on a hill top which boasts all types of wildlife and nature. At the front of the property there is a trail which leads down a winding track to a private beach which nestled away among palm trees and banana groves. To the rear is a wonderful veranda, which I made use of for the most part of my short stay here. Sitting there soaking up the Jamaican sun and enjoying the scenery made me wish that I had booked more of my holiday there. This location is nothing short of paradise. Although I did not make much use of the interior of the apartment. Everything that I needed was provided for. The fully fitted kitchen was equipped with everything that you would expect to find at home, and the living room was light and airy. The beds were comfortable and the whole place was spotlessly maintained. I will definitely be returning to this apartment for my next trip to Jamaica, the only thing I would change would be the length of time. You most certainly need more than just one night to fully appreciate this beautiful apartment. Overall, it is conveniently located-just a short trip from the airport and only a small distance from downtown Montego Bay and of course the all important Hip Strip. (Which unfortunately I didn't get to take advantage of.) But there is always next time! Highly recommended!! We were a stag party of 19 guys, having the stag celebration in Manchester. After struggling to find an apartment for us to stop in I luckily stumbled across Elizabeth Street Townhouse provided through MyPlaces. It was fantastic. I paid a deposit and paid the rest on the day with cash although it could have been paid with card which suited us fine! It was clean, spacious, with wi-fi, sky, heating essential as we stopped end of November! and even some biscuits waiting for us. There was plenty of sleeping space for everyone, three bathrooms and a conservatory. It was only 2 miles from town, which was 6 to 7 quid in a taxi, or, if walked in would take about 20 mins. 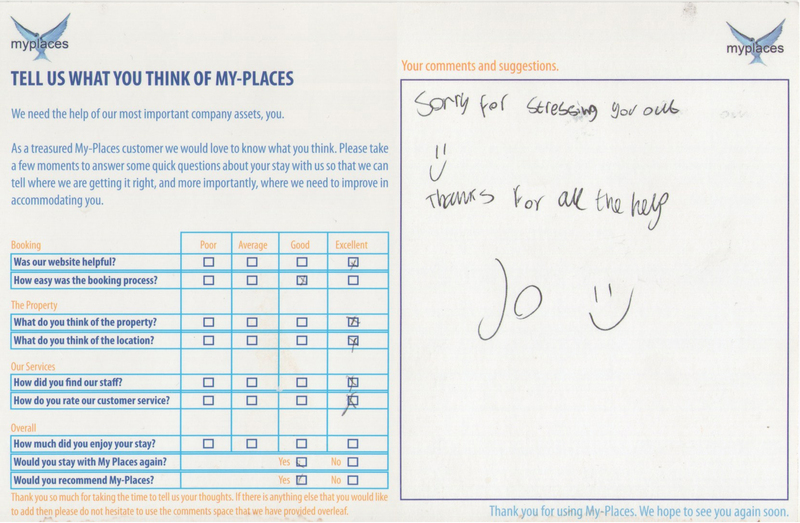 Overall I was completely satisfied with the house and the service received from the staff at MyPlaces. Ill definitely be using them again in the future. I am staying with MyPlaces for quite some time now. The staffs like Dawn, Adrian,Santino are quite friendly and helpful and all the apartments are clean and well serviced. We have everything you need.I become the fixed customer of MyPlaces. I booked abbots field court house , it was lovely, clean, lovely house, the staff at the hotel were great to deal with very helpful, I would recommend to anyone . Guest stayed in Elizabeth Street Townhouse 68. Ideally located, good quality service. 5 Friends and I stayed in skyline appartement for a study week. We enjoyed our stay there. The appartement was well furnished and in good shape. We would stay there again when we visite Manchester. Id like to pass on my thanks to My Places for offering such good value for money for a stay with my friends in Manchester. It really made it a hugely successful trip. We had a great stay in a 10person house in Manchester, it was close to the venue we were going to. 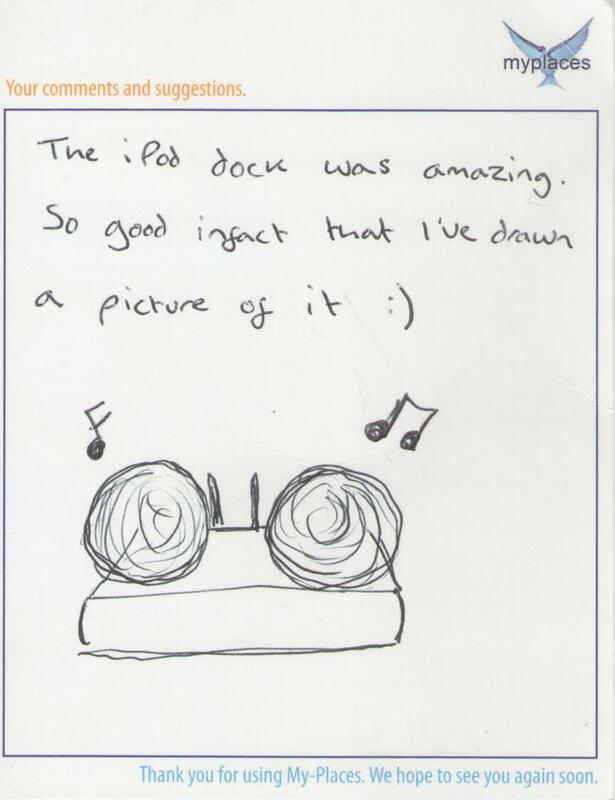 The staff were very helpful and always on the end of the phone. The house was nice and clean and had everything we required for out stay. We would go back again. Thank you!! We have just been for a weekend in the My Places apartment. We have a great weekend. All the booking and communications with the Team at My Places was quick and professional. The apartment was clean, warm, and plenty big enough for 6 and really near the Northern Quarter of Manchester. We were met promptly on arrival and checkout. The kitchen was a good size but missing a few vital bits of equipment like enough wine glasses and bottle opener! However we told the Gentleman on departure who said he would get some more. Great weekend thanks. Apartment excellent, very clean and warm, fully equipeted.staff very friendly,would highly recommend it. The apartment was perfect, everything included that we could need. Excellent location, friendly staff, will definitely stop with you again in the future. Fantastic stay. I would highly recommend a stay here. I stayed in an apartment with 6 friend and it was perfect!We decided on a late check out at the last minute and staff were very accomadating to our needs!Will definitely stay again. Great place to stay. Use these apartments whenever I stay over in Manchester as they are central, very modern and stylish and a good price. Stayed for a week in the Skyline Chambers, Manchester. The apartment was clean had all the facilities we requested and the staff were on hand to help out with any issues. i would recommend booking if you want to share a week with family and or friends. Guest stayed in Piccadilly City Centre Apartment 08. Hi Thanks a lot for our stay we had a clean and a great apartment. Spacious, great location. Clean and all round comfy place to stay. 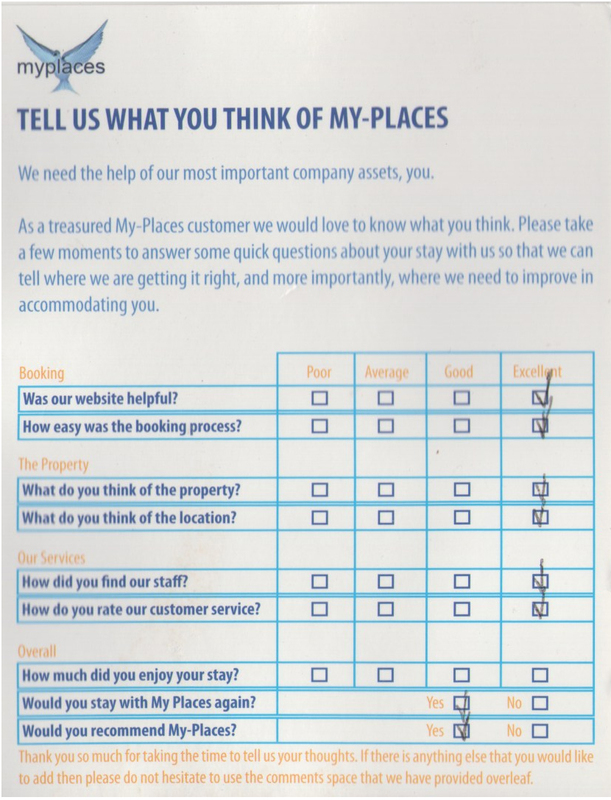 I used My-Places to accomdate ten customers during their visit to Manchester, the apartments were clean and well equipped and service on check-in was friendly and efficient. Cant fault it. Ideal location for me, offered more than I bargained for. 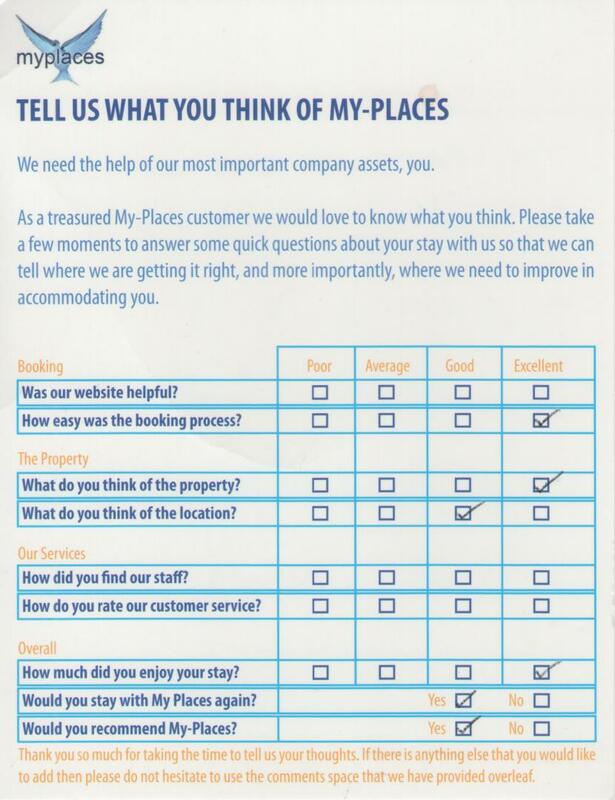 I used My-Places to accommodate ten customers during their visit to Manchester, the apartments were clean and well equipped and service on check-in was friendly and efficient. Flat was very nice inside & very spacious. I would definitely recommend this accommodation & I personally would use it again. My places were very accommodating to us also. 5* service. Es un apartamento nuevo. Con muy buena ubicación y una excelente relación calidad-precio. It is a new apartment. With very good location and excellent value for money. On me whole - fab apartment, great size for me 7 of us. Great location. We had a good time. Thank you. The apartment was as expected. There was plenty of room for all seven of us for both sleeping and sitting around in the living room. Given that the apartment sleeps 7 a couple more wine glsses would have been appreciated but tumblers will always do! The sofa bed wasn't particularly comfy but all others were fine. I went to this apartment with 7 friends for my birthday and it was ideal for what we wanted. The location is great only 5 mins from the main train station and easy reach to bars and restaurants. The sleeping arrangements in the living room are ok (if you've had a drink) but might not be too comfy otherwise especially if staying more than one night! Overall I would recommend. fantastic room, couldn't of asked for better. very clean, tidy and spacious. I will definatly book with my places again! Our flat was in Park Lodge in Alexandra Road South..we have been their for 7 days.. The location is excellent in quiet place next to big Alexandra Park and friendly neighbours.. The flat is clean with a nice kitchen .. Also the manager of the company was very helpful and friendly. Note: the mobile service coverage was weak so we need to go out of the flat to make a call or to connect internet. الموقع ممتاز والمنطقة هادئة بالقرب من حديقة كبيره والجيران الطيبين..الشقة نظيفة والمطبخ جميل والمسؤول عن الشقق جداً طيب ومتعاون..
ملاحظة:التغطية جداً ضعيفه حيث نحتاج للخروج كي نتصل او نشبك على الانترنت. We were left tea and coffee with biscuits when we arrived. The bathroom was very spacious shower was fab. Very comfortable. There were seven of us and all slept really well with plenty of bedding. keys over. He talked us through everything we needed to know even with all the chaos of my friends running around excited looking for their beds. He was a great service. The beds were made up of doubles and 6 singles. Everywhere was clean and of great standard. Reading the post below I have no idea what this person is talking about- I actually think she has the wrong company of where she stayed!! The living room had a corner sofa and two other sofa's. This was great for playing games and talking for the occasion we were there for. The kitchen proved great use for cooking also. We had our lunch, dinner and breakfast by cooking ourselves. The dishwasher was of great use as well for time. All cleaning products and condiments were provided. Can't say anything bad about this place. I will use 3 Abbotsfield court again when booking a big group. Ignore the post below. We were left tea and coffee with buscuits when we arrived. The bathroom was very spacious shower was fab. Very comfortable. There were seven of us and all slept really well with plenty of bedding. Girls night out in Manchester. All 7 girls thoroughly enjoyed our stay. The apartment was brilliantly central for everything you need for your stay in Manchester. We were checked in promtly and were made to feel really welcome. Nothing was a problem to My-Places. Thanks for an enjoyable stay. Fab location, very clean, everything catered for in the apartment, staff great and very helpful. Would recommend this to any groups of travelers. Would stay there again. We stayed in Chatsworth House. was a lovely apartment and everyone was really friendly. really good location only 3 mins from the train station and right in the town centre. We also played music and got no complaints. Only downside there was only 3 towels and between 7 girls was a bit of a mare. so take your own. overall excellent stay and was perfect service. Just be aware they do take money off your card even if you pay cash but this does go back in your account after a few days. Excellent, perfect for a hen party!! This apartment was perfect for my hen party. We were able to all get ready together and stay in the same place while enjoying a glass or two of champagne!! It is ideally situated for central Manchester, only 5 minute walk to the Printworks and the Birdcage. Me and my friends stayed in Chatsworth house 5, Manchester. Such an amazing apartment, better then we thought (pictures do not do it any justice from website). First class service and first class apartment which was worth the money. Will 100% be using this company again. Great apartment and area and a hassle free stay. Any problems we found (very minor) were rectified almost immediately without question. 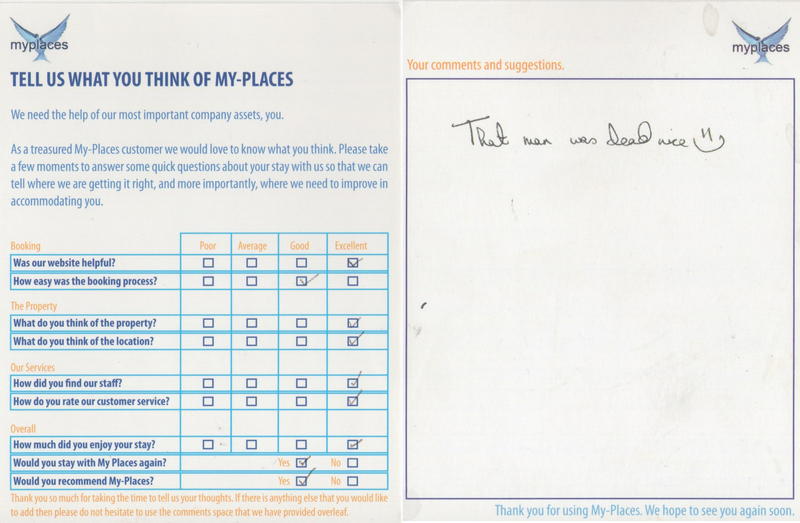 Would stay again and highly recommend myplaces. A group of us stopped in 14 Abbotsfield Court for the night so we could go out in manchester. Great accomidation! Not far from town and loads of local taxi services so was dead cheap for a taxi! the house was brillian, nice and clean and loads of room. Having sky in the apartment for great and the staff are really helpful! would stay again any time! Eleven of us stayed at 3 Abbotsfield Close for four nights - we had a fantastic time and everything was very well appointed. Really good positioning for Woodlands Road tram station to the city centre. Would not hesitate to recommend this company - especially since they threw in some free chocolates! A group of 10 of us stayed at 68 Elizabeth Street for one night for my Hen party. We were very impressed by the standard of the house. The decor was lovely, and we had loads of space. Beds were very comfortable, and all towels and bed linen were provided. We had a great night, and everyone was very impressed by the house, especially for the great value! Thank you! Myself and 6 others stayed at the Chatsworth apartment on Saturday 4th July. I'd done quite a bit of research to get us some centrally located & reasonably-priced accommodation so wasn't expecting a palace. Upon arrival, however, myself and the other girls were pleasantly surprised to find a spacious and well-maintained apartment. 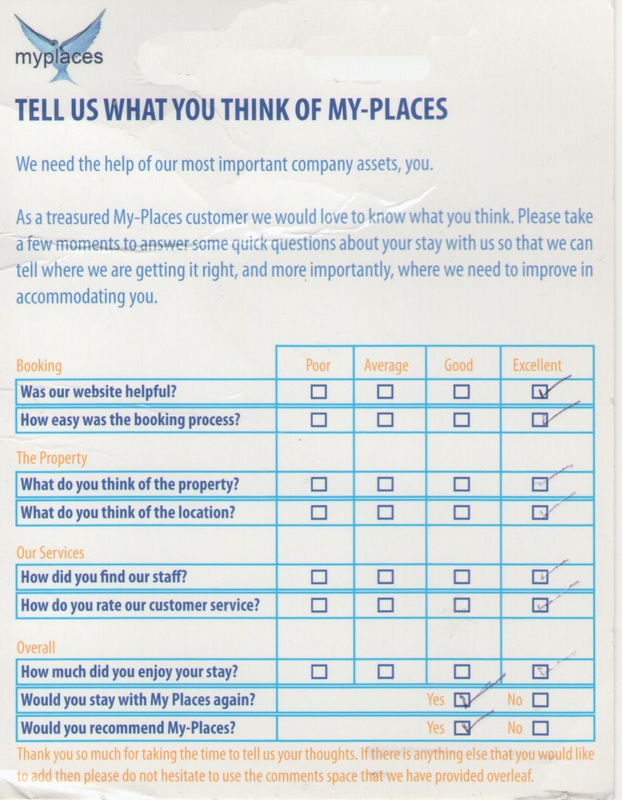 I would definitely recommend My Places and will certainly use them again in future. It is also worth noting that the customer service from staff was excellent - very accommodating and friendly! Subject: RE: You have 1 new LateRooms customer review I booked this appartment as it was pretty much the cheapest around and very central to the city. I wasn't expecting much, just a clean room and that's it. But what I got was excellent customer service from the staff who I dealt with. Everything was straight forward, we turned up, he showed us around and come time to go home, he arrived, checked the room then left us to it. It was more than just a base to dump the stuff, we had an amazing experience and the basis of it was how good the hotel was. Wasn't expecting much from them, but was definately pleased by the end of the stay. Myself and 9 friends stayed at 14 Abbotsfield, everyone was amazed with both location and the house and facilities that it offered, we will definitely be using 'My Places' again - thanks! 13 - How can we serve you better? ---> Can find no fault! we stayed over a long weekend and had a fantastic time. The apartment was tidy and clean, good kitchen and great location within walking distance of main spots in town and the train station. Would definitely stay here again. We stayed in one of the Chatsworth House apartments. Everything was nice and comfortable, the staff was friendly. We loved the free internet. I would defenitely stay there again. Six of us stopped at the Coppice on Chatsworth Road. As a person i'm the first to complain if services are not up to standard. So it's rare for me to find myself in a situation that's with out fault. Clean, tidy, professional and accommodating. I would reccomend the company to anyone and and would use them again without reservation. Stayed at the 3 Abbotsfield Court property with a big group of friends just the other weekend. Everybody was bowled over with the accommodation standards, nice conservatory, good kitchen, lovely showers and bath-rooms, and slept like logs in the bed-rooms! Really handy location, great food options in the neighbourhood, or a short, cheap cab ride to town, and on a very, very busy bus route to boot, which was most handy. Parking secure and sorted too and everybody I dealt with was lovely. Are towels supplied or do we need to bring our own? Our goal is to make you to feel youself at home. Of course, the towels are supplied as a part of the My-Places High-Quality Standard. Stayed in 107 Chatsworth House on the 10th-13th of March with my family,very clean,central to shopping,transport and the Football off course as that is why we were there, can't wait to go back and I have told all my friends about these great apartments. I will never stay in a hotel again in Manchester. Thanks! Stayed at 3 Abbotsfield Court, Manchester on 7/3/09 The house was clean and modern, plenty of room, near enough to Manc centre but in a nice and quiet location...would recommend it!